"Far and Away" began as a small film which Ron [Howard] and I talked about making, while shooting "Backdraft" in Chicago. 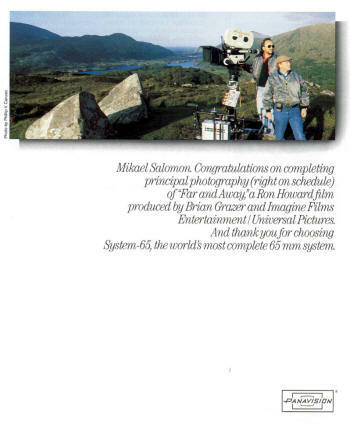 Ron have his family roots in Ireland and he thought it would be fun if I hired a small Danish film crew to make "Far and Away" (which originally was known as "The Irish Story") as a low budget production - quite the opposite of "Backdraft". When Tom Cruise came on board we could forget all about "the little film". Everything got bigger and more ambitious. "The Land Race" would involve more than 500 horses and "re-enactors" from all over the United States, so I suggested we looked into what it meant for the budget if we shot in 65mm. 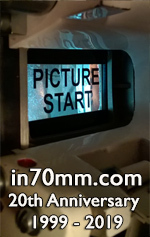 My thought was, the larger the budget we had, the difference between shooting in 35mm and 65mm would be smaller. Eastman Kodak agreed to sell us 65mm raw stock for the price of 35mm in an attempt to reactivate 65. Numerous times during pre-production we shifted back and forth between 35 and 65, since Universal was trying to save money. The argument that really hit the nail on the head, was sound quality. Sound would be much better with 6 magnetic tracks compared with 35mm optical sound. This argument does not hold any longer, and is probably the main reason why it is now impossible to convince anyone to film in 65. And now, since "Superman" is being filmed with the "Genesis" digital cameras from Sony/Panavision - it is probably the end of using large camera negatives. "The rest is history": I had - especially in the beginning - huge problems with Panavision's lenses, since they were not built for 65. I also used Arri´s new ARRI765 camera which could go up to 120 frames per second. I used a VistaVision camera for the helicopter shots since it was impossible to secure the 65mm cameras safely in the helicopters. For some of the scenes in the "land race" I used some Bell & Howell 35mm EYMOs with anamorphic lenses - which later was blown up to 70mm. We could not risk destroying the very few 65mm cameras with horse wagons or other stunts.